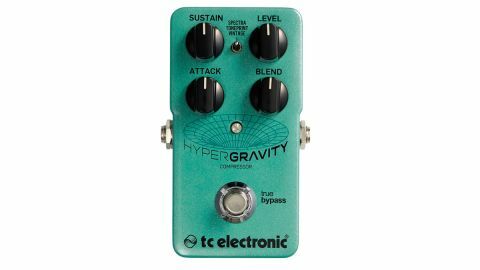 Will the HyperGravity fly high? A compressor pedal that you can program exactly to your needs. About time! Takes time to find your desired compression sound. Potential compressor users may have been put off by the fact that compressing their whole signal might mess with their sound too much. But the latest pedals offer parallel compression - via a blend control mixing compressed and uncompressed signal for natural-sounding blends. The HyperGravity features that blending facility but also ramps up the versatility by offering a range of different types of compression. A three-way switch enables you to select Vintage or Spectra, representing respectively the sort of squashy tone typical of the most-copied of stompbox compressor designs and multi-band compression that offers a more transparent signal control. Both do a decent job, but the jewel in the crown is the TonePrint option, where you can load the pedal with compression programmed by TC, one of its roster of guitarists, or create your own with the software editor. There's plenty of extra gain, too, so you can use the pedal to drive an amp.